Orchid Cottage01223 833366work Self-cateringOrchid Cottage is a spacious 19th century character cottage in the picturesque east Devon village of Axmouth just 6 miles west of Lyme Regis. It is located next to a quiet lane within a valley with steep inclines providing field and woodland views to the front and rear. 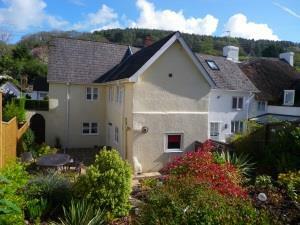 Orchid Cottage is elegantly presented with good quality furnishings. There are three upstairs bedrooms and a fourth occasional bedroom downstairs which can be used by arrangement with an additional charge. There are two first floor bathrooms, a family bathroom off the landing and an en-suite shower room off the master bedroom. Outside a private patio with a table and chairs provides alfresco dining for six next to a garden densely planted all year-round colour. There is ample parking both o street and an allocated space. Axmouth village is full of quaint thatched cottages and lies next to the River Axe just a one-kilometre level walk from the harbour ad fascinating Jurassic coast. Despite Axmouth’ s rural setting the nearby town of Seaton provides easy access to everyday shopping and amenities. In the immediate vicinity of Orchid Cottage there are numerous footpaths providing varied walks with spectacular views. The nearby south west coastal path passes through the Undercliffs national nature reserve which extends between Axmouth and Lyme Regis. The Seaton wetlands nature reserve provides the ideal opportunity for birdwatching along the Axe river estuary.